The history of Ferrara, resplendent with famous people and impressive urban projects, is inextricably linked to the Este dominion and in particular to the magnificence of the Court between the fifteenth and sixteenth centuries. In 1995 it was included in the UNESCO world heritage sites list, as an exceptional example of a Renaissance city. Although the first nucleus of the city was a Byzantine military settlement (the seventh century “Castrum” located to the south-east of the city), it was during the medieval period that the most characteristic streets developed, such as Via delle Volte and Via San Romano, and the main square (now Piazza Trento e Trieste), with the Romanesque-Gothic Cathedral (1135) on one side, a true masterpiece of architecture and sculpture and a veritable treasure trove of works of art from various periods. It was in the twelfth century that the Este family settled in Ferrara, legally becoming lords of the city in 1264 with Obizzo II. This was the beginning of a remarkably rich and eventful period for Ferrara. With the establishment of the University (1391), where Nicolaus Copernicus graduated in canon law, the construction of the Castello Estense (1385) and other valuable architectural structures, built both in the medieval and central Renaissance parts of the city, during the fifteenth and sixteenth centuries Ferrara became one of the most important capitals of the Renaissance, especially as a result of the intellectual environment that was cultivated in Court. The Este Marquises (later Dukes) invited and welcomed people of extraordinary value such as Leon Battista Alberti and even the great Michelangelo; it was here that the great epic poems of Boiardo, Torquato Tasso and Ariosto were created, whilst the pictorial art of Ferrara reached its highest level of figurative expression with the frescoes in the Salone dei Mesi at Palazzo Schifanoia, one of the most evocative sites of Este grandeur. It should also be noted that in 1492 Ferrara adopted an ante litteram urban planning program, the Addizione Erculea, which aimed at doubling the size of the medieval city. Previously construction had only developed in the area to the south of the castle, whereas the new plan included broad straight streets, churches and convents, magnificent squares and fortifications. The “Terranova” as it was called at that time, still appears to be shrouded in a rich and fascinating atmosphere, which the writer Giorgio Bassani masterfully captured in his works: we can feel this mood on the Este ramparts and defensive structures or on streets such as Corso Ercole I d’Este, one of the most beautiful in the world, ennobled by magnificently designed Renaissance buildings, among them the Palazzo dei Diamanti (1493), which today houses the National Art Gallery of Ferrara and the Gallery of Modern and Contemporary Art, host of numerous important exhibitions. This extraordinary addition, considered necessary by Duke Ercole I d’Este and built by the court architect Biagio Rossetti, is considered one of the most important urban interventions of the Renaissance; the image that the city assumed after this great undertaking, led the historian Jacob Burckardt to define Ferrara as “the first modern city in Europe”. In addition to the buildings already mentioned, the medieval and Renaissance periods provided Ferrara with many other prestigious constructions, rich in artwork and absolutely worth visiting. These include: the Museo della Cattedrale in the former convent of San Romano, Casa Romei, the Palazzina di Marfisa d’Este palace built in1559, the Museo Riminaldi in the Palazzo Bonacossi, the Palazzo Ducale (the former residence of the Este family, now owned by the Municipality) and the Museo Archeologico Nazionale in the so-called Ludovico il Moro palace (1500-1504), not to mention the convents and above all the many churches of various eras, with splendid works of art, where it might seem that time has stopped. The historical town centre is still an attractive place to live today, not only because it has been enhanced and upgraded in order to preserve its unique characteristics, but also because it is almost entirely surrounded, for more than nine kilometres, by massive mura (city walls) and shaded woodland areas, with bike paths that follow fascinating routes. The ancient defensive system has been acknowledged as one of the most complete and varied structures that exist in Italy, as it illustrates the most significant periods of Italian military architecture in the history of fortification. With the surrounding green earthworks, the fifteenth-century towers to the north, the sixteenth century ramparts to the east and south, and the two bastions of the seventeenth-century papal fortress, an attractive and functional ecological belt has been created around the city that encloses the metaphysical historical city centre. Furthermore, the earthwork defensive system has now developed into an extended park with attractive pedestrian and cycle routes that integrate the internal city walls with the Parco Urbano, immediately to the north, named after Giorgio Bassani. 1598 brought the Este era to a close and during the following centuries Ferrara became a border post for the Papal States. In 1796, French troops occupied the city, but after the defeat of Napoleon and the Congress of Vienna (1815), it became part of the Papal States again and, under varying circumstances, remained as such until just before the unification of Italy. However, further notable features appeared both from the urban and cultural point of view, with the construction of churches and impressive buildings, which offer us a remarkable insight into art and architectural history between the seventeenth and nineteenth centuries, as is excellently shown by the Teatro Comunale (1790-97), now dedicated to the great Maestro Claudio Abbado. During the twentieth century several of the streets in the city centre were further enhanced with important buildings, such as the Palazzo delle Poste (Post Office) (1927-29), characterized by a neo-fifteenth century style, but also works of the best local rationalist architecture: the Palazzo dell’Aeronautica (Air Force Offices – 1935-37) and the public offices of the nineteenth century additions, such as the Alda Costa school (1932-33) and the Museo di Storia Naturale are considered masterpieces of this period, perfectly placed within the urban context and recently rediscovered by citizens and tourists. 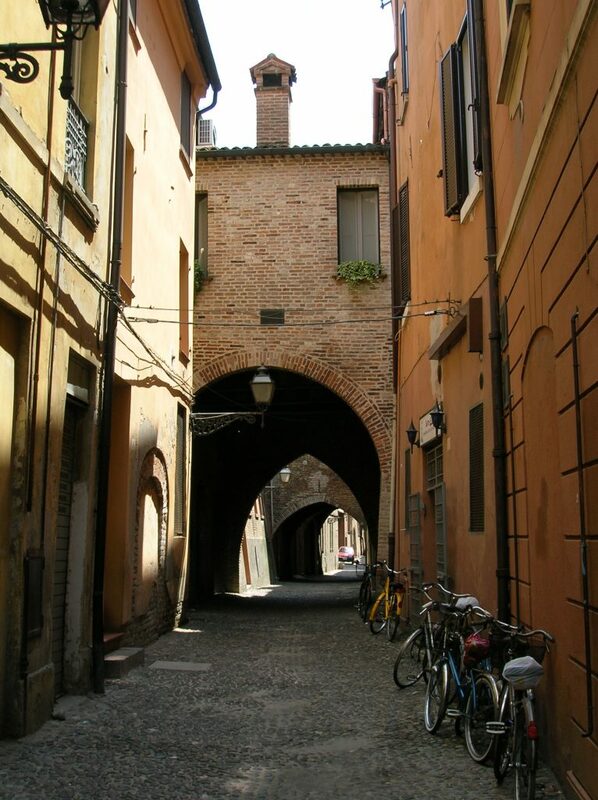 All this and more can be discovered in Ferrara, a city rich in history and monuments, which can be visited on foot or by bicycle following the many and varied routes.